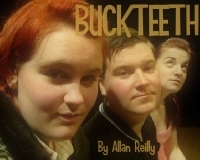 Buckteeth is created and written by Allan Reilly, a North West playwright. This play looks at the hidden truths of Mark and Kelly’s fastly developing relationship. Their evening of romance in interrupted by the larger than life Tippi who engages the happy couple in a night of truth facing and Icelandic singing! Highly entertaining and fantastical this performance is a great insight into the truth lurking behind the longing looks and grand gestures.